What was perhaps even more curious about the DOJ complaint, was the reference of a "senior Goldman official" who was instrumental and involved in Goldman's establishing of close ties with both 1MDB and the Razak government, ties which would eventually allow Goldman to issue $6 billion in three issue in bonds underwritten by Goldman which netted $600 million in fees for the bank. And, as we added over the weekend, all of this is happening at a terrible time for Goldman" which recently underwent a leadership transition, with longtime former CEO Lloyd Blankfein handing the reins to John Solomon, who is best known for moonlighting as a DJ. And as the breadth of the scandal - and the likelihood that the bank's most senior employees may have looked the other way (though, to be sure, Blankfein has repeatedly denied having any knowledge of Goldman's role) - becomes increasingly apparent, the timing of Blankfein's exit is looking more and more suspect. And now we now know why, because it now appears that our veiled reference that Blankfein may have been the unnamed senior Goldman official, was in fact accurate. In a new report, Bloomberg writes that years before Goldman Sachs arranged bond deals now at the heart of globe-spanning corruption probes, "the firm’s then-CEO Lloyd Blankfein personally helped forge ties with Malaysia and its new sovereign wealth fund." But much more importantly, Blankfein was the unidentified "mystery" high-ranking Goldman Sachs executive referenced in U.S. court documents who attended a 2009 meeting with the former Malaysian prime minister, Bloomberg's sources said. And what's worse, the meeting was arranged with the help of men who are now tied to the subsequent plundering of the 1MDB fund, according to U.S. court documents unsealed last week. It was this high level gathering - which was also attended by then Goldman CEO Blankfein - that laid the groundwork for a relationship that would prove extremely profitable for the investment bank. While a Goldman spokesman refused to comment to Bloomberg on Blankfein's behalf, the bank has repeatedly said it knew nothing about any corruption, and simply believed proceeds of debt sales it underwrote "were for development projects" and then threw Leissner under the bus, accusing the former Goldman partner of withholding information from the firm. In addition to Goldman, the meeting was also attended by the now infamous Jho Low, then a largely unknown banker whose meteoric rise had managed to cultivate relationships with senior Malaysian government officials, including then-Prime Minister Najib Razak. And while Low’s lavish spending habits were New York tabloid fodder around the time of the meeting, Bloomberg adds that starting about two months before the meeting, Leissner and another Goldman banker began a years-long effort to bring Low aboard as a client, a request that compliance workers at the firm consistently denied. 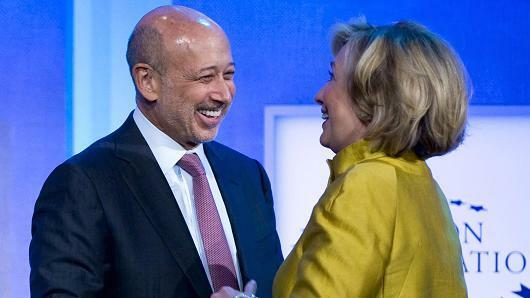 Was it Blankfein's involvement that eventually greenlighted the bank's lucrative relationship with 1MDB and Malaysia? The DOJ is reportedly looking into precisely this. That said, there’s no indication that Blankfein was aware of the internal assessments of Low, or knew the identities of all the people present at the meeting. The documents filed by an FBI agent in June said that evidence supports Low was present at the meeting. The agenda for the November 2009 meeting was mapped out by Low and included a "debrief" with Najib and the "1MDB boys" after Goldman executives had left, the documents show. At the same time, the meeting offered Blankfein a chance to speak with Najib in his first year as prime minister, and Najib’s visit to New York included meetings with other business leaders and U.S. investors. A month after the gathering, Malaysia’s securities commission announced that Goldman Sachs would set up fund management and corporate finance advisory operations in the nation. Fast forward to last week when the U.S. accused Low of teaming up with the Goldman bankers to pilfer money from 1MDB, and more importantly, Leissner pleaded guilty to conspiring to launder money and violating the Foreign Corrupt Practices Act by paying bribes. Furthermore, Goldman’s earnings from the deals have also become a sore point with the new Malaysian government, which hopes to recoup some of the money. As for the former Goldman CEO, as noted above, Blankfein who recently retired as the bank's chief executive but still serves as chairman, said at a conference in New York last week that he’s not aware of senior managers missing red flags in the 1MDB dealings. Instead, he said, the matter was an issue of a few employees dodging bank controls and lying about it. Of course, it would be naive to think that Leissner was able to pull enough strings on his own, not just at the bank, but also across the US state department, to allow billions in illicit funds to flow across US borders. As for Blankfein, if the DOJ is indeed looking at the bank CEO, then perhaps it should also look at the State Department, and the Secretary of State who presided at the time many of these alleged fraudulent schemes took place.